As children, most of us were introduced to cemeteries with sadness and mourning of the loss of a loved one, ghosts and zombies from a frightening movie, or mystery and the unknown of death itself. Each of these combinations are perceived as negative, scary, and repulsive. It’s very true there is no way to know what happens after death. Will we live forever in paradise, be reincarnated as a lion, or simply cease to exist? However, we cannot let that take away from the serenity, peacefulness, and the opportunity to learn and grow from those who have come before us. We have an innate tendency to fear the unknown, but a cemetery was never meant to be fearful, in fact its purpose was near opposite. Cemeteries are meant to remember, to bring closeness to loved ones. Graveyards are meant to inform and remind those living now, of the past, and the people who have come before, of their lives, and accomplishments. 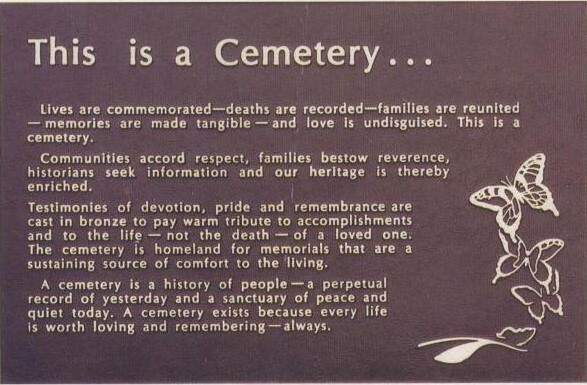 If we can begin to look at cemeteries for the societal and emotional benefit they were created for, instead of the frightening crypts of our imagination; we can grow to appreciate and learn from the past in a new way. Along with this appreciation, we can come closer to the peace that is found in the rolling hills of a cemetery. Lamb, Robert. “What makes graveyards scary?” HowStuffWorks Science. HowStuffWorks, 23 Sept. 2008.